On Vancouver Island, British Columbia we spotted this cougar and watched him in action as he kept a close eye on his prey, waiting for the right moment to pounce. A cougar will get to within thirty feet of its prey and once caught will feed on what he needs and then hide the rest until its next meal. 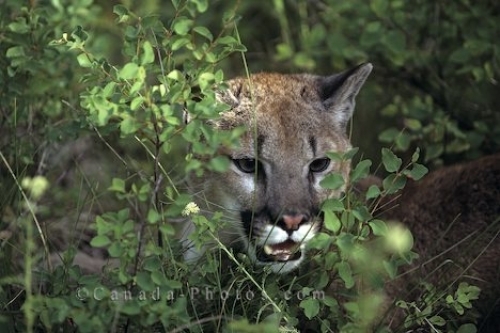 Picture of a cougar peering from behind a plant on Vancouver Island, British Columbia.